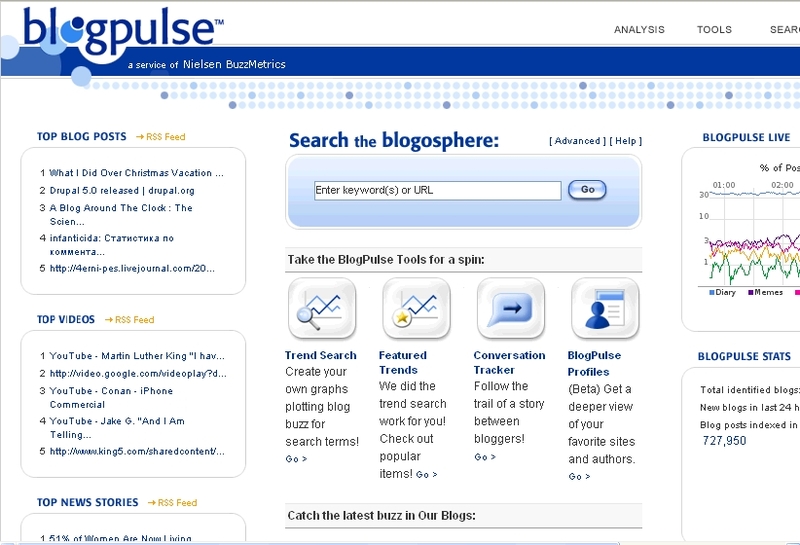 Another trend tracker with a similar feel to Google Trends: Blogpulse by ACNielsen. A brief tour around the site reveals interesting buzzword tracking tools, but I yet to really test them out. Maybe we need something like this specifically for Asia. Among other data, MindShare’s recent mPulse survey on blogging attitudes and behaviours in Asia (Oct-Nov 06) shows that over two-thirds of 15-35 yr-olds in China and Taiwan have their own blogs (with 96% blog readers in China! ), with about half of this age group blogging in Singapore and Malaysia. Technorati’s data on March ’06 has also revealed that 52% of blog posts are in Chinese or Japanese. If anyone comes across a similar ‘trend tracker’ tool focused on Asia or any Asian country, please leave a comment! Check out sifry.com for the latest on the blogosphere – latest stats are from July 2006. English now makes up 39%, Japaanese 31% and Chinese 12% of all blog languages. It is generally acknowledged that Asian in general and Chinese blogs in particular are under-counted due to tech protocols.